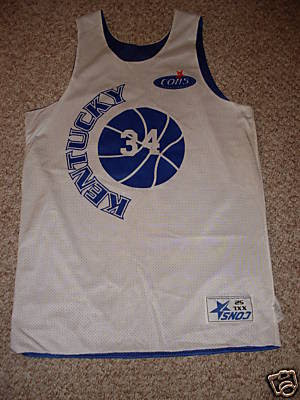 The Converse Blog: 'S Friday Flashback: University of Kentucky Practice Jersey. 'S Friday Flashback: University of Kentucky Practice Jersey. What a difference a year makes. This time last year people were looking forward to the second year of Billy Gillispie. We had just finished our surprising run that got us into the NCAA tournament and Coach Gillispie had just won Co-Coach of the year in the SEC. Now, today Gillispie is out as head coach at the University of Kentucky. I've gone back and forth on this issue since midway through the season when we started dropping games like rain drops falling from the sky. So who will replace Billy G? Well I am not quite sure, but if it was up to me we'd go after Sean Miller of Xavier. However, I am hearing that Billy Donovan is the #1 choice. Oh well, there is a new conference for UK at 4:30 and Billy G is having his own news conference tomorrow morning at 11. Sounds like chaos to me, but it sure is exciting. So what does this have to do with Converse? Directly, probably not much. It's been well documented on this site that Kentucky is traditionally a Converse school. I would love for Kentucky to return to Converse someday soon. However, Kentucky is in the first few years of an 11 year contract with Nike. I can dream can't I? 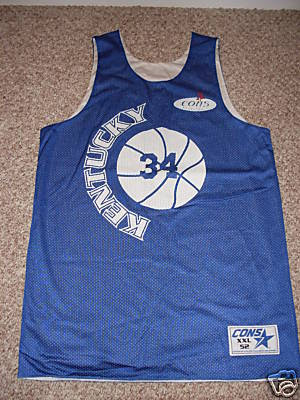 Which brings me to today's Friday Flashback, Converse Kentucky practice jerseys from what I think was the 1995-96 season. Check out Kentucky Sports Radio for all of your UK Coaching updates. Thanks for checking out the Converse blog and enjoy the madness that is a coaching change at the University of Kentucky. Remember the Cons Blue that Kentucky wear that jeans material? Also don't forget that UNC a school I can't stand was a huge Converse school.